Merry Christmas to everyone who passes by SuperPhillip Central, both frequenters and rare passersby! SuperPhillip Central wishes you and yours the very best, and if you don't celebrate Christmas, then a happy holiday season to you! SPC gives you the gift of a new article for this Christmas night: a look at some of my favorite winter-themed levels in gaming. By no means is this an exhaustive list, so after you've checked out my picks, name some of your favorite winter wonderlands in your favorite games. If you're so bold, also tell the community why you chose that level or levels! 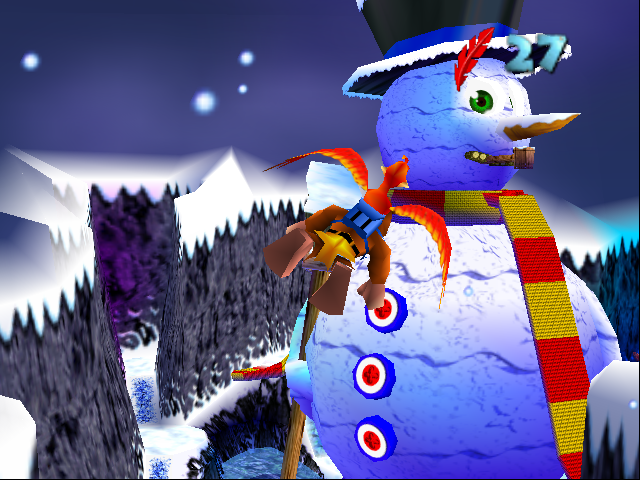 When I think of Christmas and winter in gaming, this level in Banjo-Kazooie is usually the first that comes to mine. Freezeezy Peak is all winter all the time, featuring a wide array of landmarks fitting for the season. Such sights include the massive, and I do mean massive, snowman structure in the middle of the level, where Banjo can climb the length of its scarf, get a Jiggy from its cob pipe, and even reach the top of its hat where a Jinjo stands. Then, there is the Christmas tree where you can save a bunch of lights from being gobbled up, a cave housing a bear-loathing walrus, frozen ponds, angry snowmen that love chucking snowballs at inattentive bears and birds, and an igloo housing a family of four polar bears. Top it all off with this sensational theme, and you have a cold yet cozy world worth exploring. There are so many terrific levels and worlds in the Super Mario series to choose from. I was leaning towards Cool, Cool Mountain and Snowman's Land from Super Mario 64, but then I remembered this recent example of a wonderful winter wonderland. 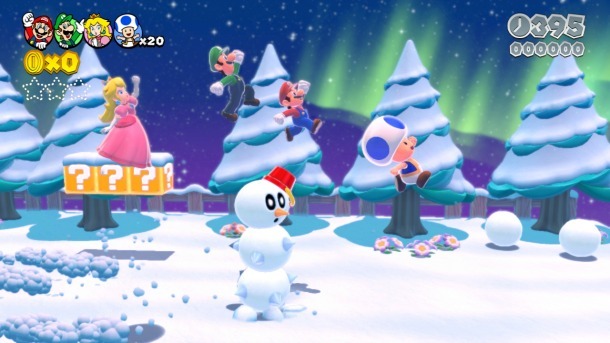 While it might not have the same openness of the Super Mario 64 levels I mentioned, Super Mario 3D World's Snowball Park is a great reminder of the season with Mario and crew able to pick up and toss snowballs at enemies and slide around on the ice. Then, you have the second half of the level where our heroes can leap into giant ice skates, zipping across the ice as they maneuver their way to the level's end. Snowball Park is a modern Mario level that just screams winter. Nothing in a game gives me as warm a feeling as walking around my town in winter in Animal Crossing, no matter the version of the game. 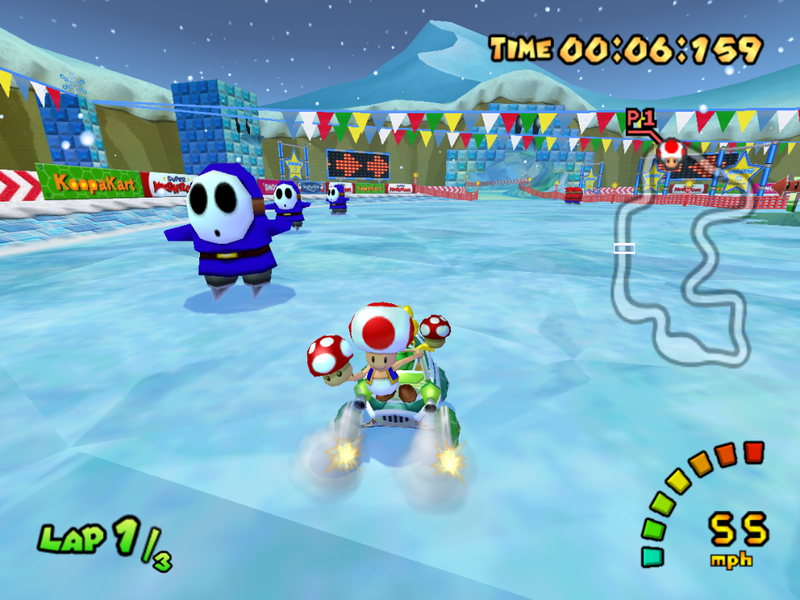 Mario Kart 8's second DLC pack brings that same exact warmness in a race with the winter version of the Animal Crossing track, a track that comes in four varieties, each a different season. Everything in Mario Kart 8's winter theme of Animal Crossing is covered in a generous dusting of snow, illuminated under the starry night sky. Houses have their lights on both indoor and out, providing a soothing glow, while many of the trees have beautiful Christmas lights on them. 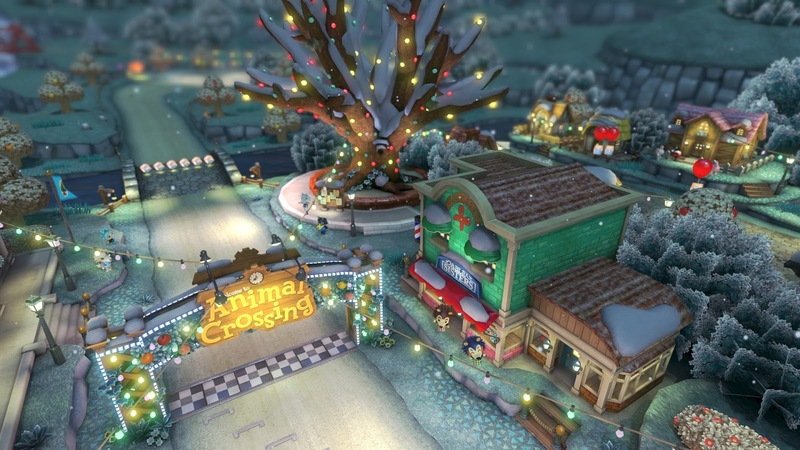 There is no better track in the Mario Kart series that exudes the feeling of Christmas and winter as well as this version of the Animal Crossing track in Mario Kart 8. When a level starts out with your character zooming down a mountain on a snowboard with an avalanche hot on his trail, you know you're in for something way past cool. In fact, the Ice Cap Zone is way past cold! (I'll see myself out later.) A two-act zone that features both outdoor sections and indoor cavernous sections, the fifth zone in Sonic the Hedgehog 3, the Ice Cap Zone is a one-two punch of awesomeness. 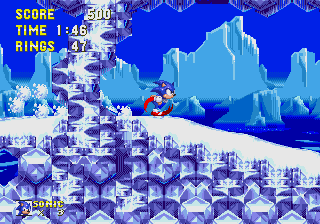 From the rocking soundtrack to the breaking through chunks of ice and walls of snow, there is no better zone in my opinion from the Sonic the Hedgehog Genesis trilogy that is as fantastic as Ice Cap. Of course, as a kid I could never reach it because of that stupid barrel in the preceding zone, but now that I'm able to, I appreciate the Ice Cap Zone even more! Located north of the nearby Great Glacier, Icicle Inn is a winter resort town that gives off a warm (there's that word again) and inviting feel. The light that pours out of the windows of the various cabins in the town shine brightly and magnificently, and the sun in the sky glistens on the snowy ground. It's a town so lovely and welcoming that you really want to stay there for as long as you can. Of course, that isn't possible as there is a world to save and a villain to defeat in Sephiroth. Still, you can enjoy a trip down the slopes with an enjoyable snowboarding mini-game, one that became so popular that Square Enix turned it into a mobile game. Nonetheless, between snowboarding sown the slopes and admiring the pure and genuine beauty of Icicle Inn, I'll always choose the latter. If you're tired of running and gunning through sand, then maybe you'll appreciate this wintry and Christmas-y take on the OG Crash map in Call of Duty 4: Modern Warfare. Instead of sand and an afternoon sky, you get snow and nighttime air. Buildings once derelict and dull are now covered with Christmas lights and decorations, fitting for the season. Those aren't the only major changes to the map, as standing tall and proud next to a downed chopper is a 20-foot Christmas tree with all the trimmings, including a whole slew of Christmas presents at its base for all the good little soldier boys and girls involved in combat. We go from one game with guns to another, although this one has more tact and strategy involved, unless you're not one to go all stealthily. Metal Gear Solid's Shadow Moses is the locale that the entire game takes place in. While most of the game takes place indoors, some of the more memorable moments occur outside with modest visibility and sizable snowfall. From the ambient sounds of Solid Snake's feet crunching the snow below him to the arctic winds enveloping the area, Shadow Moses's outdoor areas ooze with wintry atmosphere. 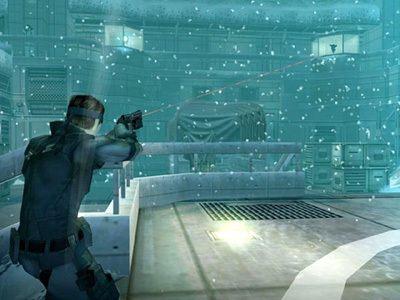 Shadow Moses was such a pivotal place in the Metal Gear Solid series that it would return in Guns of the Patriots with even more fanfare but even less visibility! 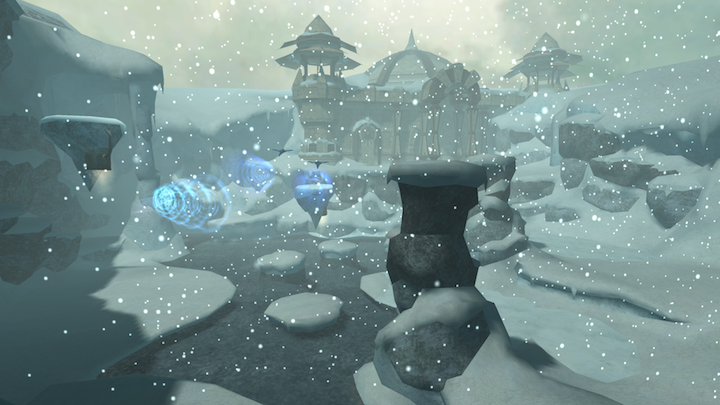 My first time stepping into Phendrana Drifts, like a lot of players, led to a breathtaking moment of seeing a wide open expanse filled with falling snow, icy and intricate architecture, and a Metroid-style winter wonderland before my very eyes. Between the first open room complete with Chozo ruins on both ends of the map, the underwater expanses, the icicle-covered caverns, and open canyons, Phendrana Drifts is one of the more beloved areas in the Metroid Prime trilogy. Few areas in gaming exhibit as much wonder as Phendrana does. You can feel the cold and chill of the area just by the stunning ambiance and environmental cues. Retro Studios did a phenomenal job with creating Phendrana Drifts, and it still remains one of the most prolific places in Metroid series history. 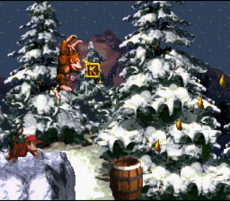 The first level of Gorilla Glacier in Donkey Kong Country gives you a rough feeling of what to expect in the world. With a breathtaking scenery and environment of snow-covered pine trees, you can easily find yourself losing focus and falling into a pit or smacking right into a foe. As you progress through the level, what was once a slight flurry of snowfall turns into a generous gift of snow from the sky. It makes the final section of the level where DK and Diddy must time with perfect precision their being shot out of a series of rotating barrel cannons all the more difficult to complete. But, once you do, the feeling of relief and accomplishment is one you won't forget for quite a while, much like the entire level of wondrous winter spectacle. 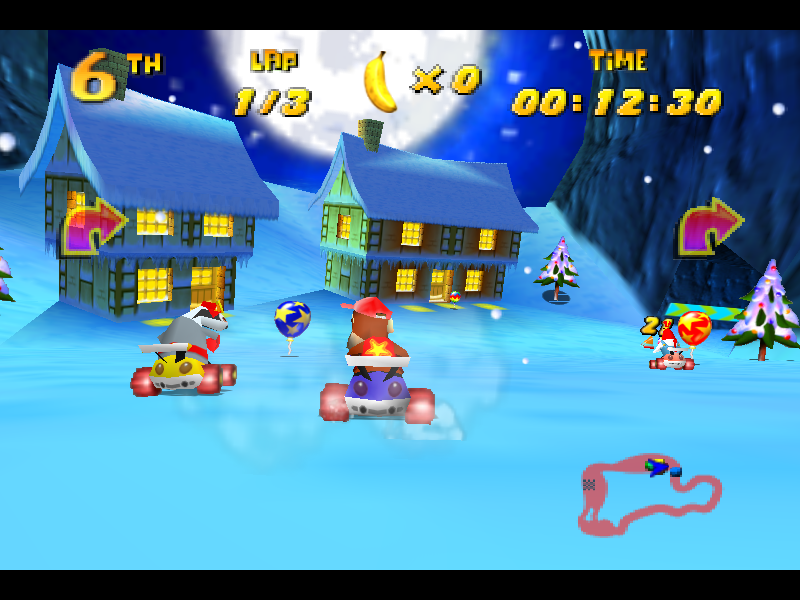 I have fond memories as a middle school student where one Christmas one of my presents was the gift of Diddy Kong Racing, a kart racer that remains my favorite to this day. One of the reasons for this was memories of racing through the wintry and snowy Frosty Village track. From the start of the race, a body of water surrounds the track on each side before leading into an archway that starts a downward slope towards the titular village. A quick right turn leads into an icy tunnel that opens up into a large and expansive section of track surrounded by shining streetlamps and massive trees. Following that is the home stretch, a right turn that if you have a hovercraft, you can pass through a waterfall on the inside, a fun shortcut to take given you've got the vehicle. 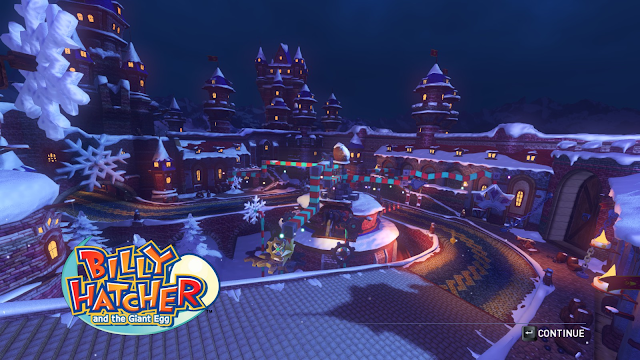 Besides the well done track design, the environment is full of winter touches that really puts me in a happy and joyous mood no matter what season I race on Frosty Village-- though winter is preferred! From one kart racer to another, Chilly Castle from Sonic & All-Stars Racing Transformed represents Billy Hatcher & the Giant Egg, a GameCube-exclusive game from the creator of Sonic the Hedgehog, Yuji Naka. The race starts off with a series of turns and a branched path through a cozy winter village. The village roads soon converge as racers ride under a gate leading into a section surrounded by castle walls. After a handful of increasingly tighter turns, the race enters a frozen tunnel where racers' rides transform into aquatic cruisers and boats. After this watery ride is finished, the tunnel launches the racers back to the starting line. The immense amount of detail in Chilly Castle, welcoming starting village, and feeling of winter all present a superb track worthy of the season.